Jerry Schilling will unveil the Elvis On Tour star at the movie theater 'Utopolis' in Turnhout (Belgium) where the European Premiere of the digitally remastered 'On Tour' takes place on August 15th. 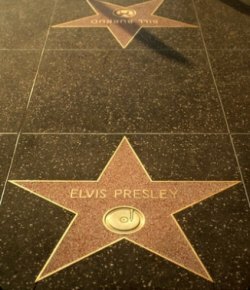 This will be the First Elvis star in Europe! Ticket holders can attend this special ceremony for no additional charge. After the unveiling of the Elvis Movie Star, Jerry Schilling introduces the new movie.
" This is about the first official Hollywood Walk Of Fame star, recognized by the chamber of commerce in Hollywood. " - This is about the first official Hollywood Walk Of Fame star, recognized by the chamber of commerce in Hollywood. Wasn't the FIRST EUROPEAN star installed in Scotland? At the Prestwick Airport? This where Elvis landed waiting for another plane to take him home for his Army discharge.